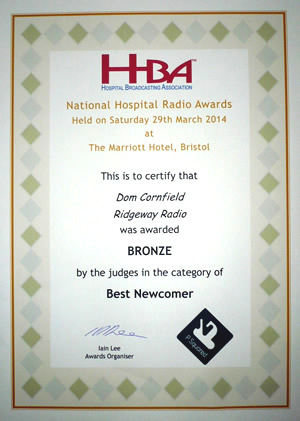 We are delighted to announce that, following the National Hospital Radio Awards ceremony held in Bristol on Saturday 29th March 2014, Ridgeway Radio presenter Dom Cornfield received the Bronze award in the category Best Newcomer. Our heartiest congratulations to Dom! 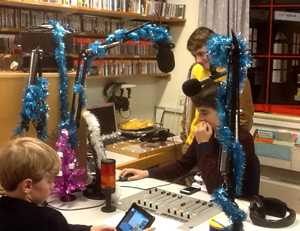 "This was a very polished performance and a great listen from someone just starting out in hospital radio. Engaging and entertaining." Click the play button below to hear Dom's entry. The entry from our Kingfisher Club team (some pictured left) was placed in the Top 10 in the category Best Programme with Multiple Presenters, a fantastic achievement for a group of presenters, the youngest of whom is 11, in a national competition! 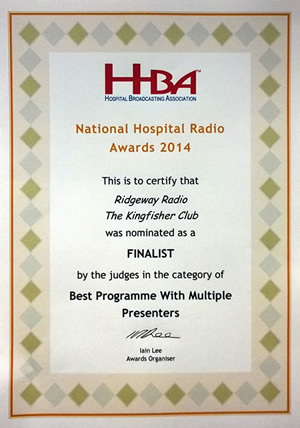 "Congratulations to everyone for getting into the top ten in two categories. Dom's bronze award is a credit to him. 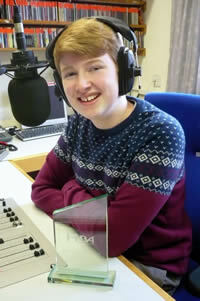 These achievements are important for the future of hospital radio, and potentially for the careers of young broadcasters. Everyone should be proud of themselves and their colleagues. Well done! The 19 young people who dedicate their free time to help patients, are a magnificent example of just how good our young people really are." "These guys are a fantastic team! Up to 10 of them work together brilliantly to make real radio for their listeners - They are the broadcasters of the future. Watch this space!". Click the play button to listen to the Kingfisher Club entry.